Alexandra Daisy Ginsburg, Jane Calvert, Pablo Schyfter, Alistair Elfick, Drew Endy. 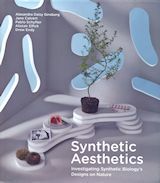 Synthetic Aesthetics: investigating synthetic biology's designs on nature. Synthetic biology manipulates the stuff of life. For synthetic biologists, living matter is programmable material. In search of carbon-neutral fuels, sustainable manufacturing techniques, and innovative drugs, these researchers aim to redesign existing organisms and even construct completely novel biological entities. Some synthetic biologists see themselves as designers, inventing new products and applications. But if biology is viewed as a malleable, engineerable, designable medium, what will be the role of design and how will its values apply? In this book, synthetic biologists, artists, designers, and social scientists investigate synthetic biology and design. After chapters that introduce the science and set the terms of the discussion, the book follows six boundary-crossing collaborations between artists and designers and synthetic biologists from around the world, helping us understand what it might mean to design nature. These collaborations have resulted in biological computers that calculate form; speculative packaging that builds its own contents; algae that feed on circuit boards; and a sampling of human cheeses. They raise intriguing questions about the scientific process, the delegation of creativity, our relationship to designed matter, and the importance of critical engagement. Should these projects be considered art, design, synthetic biology, or something else altogether? Synthetic biology is driven by its potential; some of these projects are fictions, beyond the current capabilities of the technology. Yet even as fictions, they help illuminate, question, and even shape the future of the field.